We are pleased to announce that we have added Lawrenceburg Utility Systems in Lawrenceburg, Tennessee to our list of valuable clients. 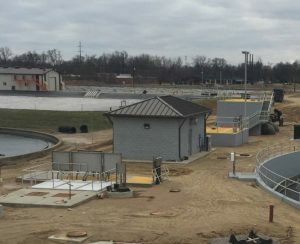 The 2013 expansion of the McKenzie T. Moss Water Treatment Plant to 15 MGD for the Hopkinsville Water Environment Authority (HWEA), designed by J. R. Wauford & Company, has been recognized once again. They were the recipient of the 2015 Award of Excellence for Water Distribution Systems Operation by the American Water Works Association – Kentucky / Tennessee Section. What outstanding achievements! Congratulations to the great team who continue making this addition a success! Work on a Sewer Master Plan is 85 percent complete and being written in conjunction with the Corrective Action Plan/Engineering Report required by TDEC. A report is being provided for the submission of a 2016 Community Development Block Grant Sewer Rehab project. The Automatic Read Water Meter System Phase 2 project is under- way. The pre-construction conference was held on January 13 with commence work date scheduled for January 25. Baird Contracting is the Contractor for this project. Analysis of the Peak Wastewater Diversion Pumping Station is underway to determine methods to optimize the station performance. The Capacity Assessment Plan, Sewer System Evaluation Survey Work Plan, Fats, Oils and Grease Control Program, and Sanitary Sewer Overflow Response Plan are complete and approved by the EPA as part of the Administrative Order of Consent. Work is underway on the Capacity Assessment Report. Bids for the Carters Creek Pumping Station Renovation were opened on December 17, 2015 with the low bidder being Cleary Construction in the amount of $651,000. Preconstruction meeting scheduled for February 18. A bid opening for the Holiday Drive and Lantana Estates Water Line Replacement Project, which consists of the replacement of 19,000 L.F. of 6-inch asbestos cement water line was held January 19 with a low bid of $896,855.05. A Community Development Block Grant was awarded for Sewer System Rehabilitation, in the Kayser Roth area, in the amount of $449,596. Plans and specifications have been completed and are awaiting approval. Design for 26,000 L.F. of 4 and 6-inch water line is complete and under review. Funding for this project was awarded with the Abandoned Land Mine Fund in the amount of $363,000. Work on the Hwy 27 North White Oak Road sewer lines is underway with Norris Brothers Excavating being the Contractor. Currently, the Contractor is laying sewer line. Bids were opened February 4 for the new 200,000 gallon Clarkrange Elevated Tank with the low bidder Phoenix Fabricators and Erectors at $610,717. An engineering report for an ARC grant application has been submit- ted for a 12-inch water transmission line from FCUD’s Clarkrange Tank to the Industrial Park. The $10,268,077 North Wastewater Treatment Plant Expansion Project will expand the peak flow capacity from 15.0 MGD to 25.5 MGD. Contractor is currently placing concrete drives and preparing new equipment for startup. Final plans and specifications for renovation of the aerobic sludge digesters at the North Wastewater Treatment Plant are complete and have been approved by KDOW. This project includes replacement of the existing sludge transfer pumps, building electrical system, and HVAC system. Painting and renovation of the 500,000 gallon Frontier Water Storage Tank is nearing completion and currently awaiting disinfection and site cleanup. Design of the South Water Treatment Plant renovation, which includes a new 4.0 MGD GE Water and Process Technologies Membrane Filtration System, Solids Contact Clarifier and GAC Contactors is underway, Final Plans and Specifications for a new 800,000 gallon prestressed concrete clearwell have been completed and approved by KDOW. Bids for the South Water Treatment Plant High Service Pad Mount Transformer were opened on January 27 with other marketing materials, such Timmons Electric Co. Inc. being the low bidder at $31,900. Bids will be opened for the SWTP Conical Clarifier Rehabilitation Project on February 15. Draft Plans and Specifications for the Vine Street Water Storage Tank Renovation, which includes repainting the tank, miscellaneous repairs, and construction of a new equipment room, have been submitted to the Owner for review. A Pressure Study was conducted and water meter data is currently being collected by the Owner for improvements to Graham Hill Tank Area of the North Water Distribution System. Work for the $525,000 CDBG Sewer Rehab project is nearing completion with Dynamic Construction of Gordonsville, Tennessee being the Contractor. Clean-up remains. Gary Allen Construction was the low bidder for the ARC/SRF project for Lewis County and Hohenwald that extends a 6-inch water line approximately 28,000 L.F. along Summertown Hwy. The low bid was $427,681.83 with a seven month completion time table. Assistance with preparations for State Pretreatment Audit Inspection was provided. Report for a 2016 ARC grant was submitted to South Central Tennessee Development District for Water System Rehabilitation. Report for a 2016 Community Development Block Grant focusing on Water Rehabilitation was submitted to SCTDD. Plans and specifications for Priority No. 3 Phase 7 are nearing completion. The U.S. Highway 41A water line project, which consists of approximately 15,300 L.F. of 20-inch water line to increase flow and pressure at the Interstate 24 interchange, in the amount of $1,659,958, is on- going. Contractor has currently installed approximately 80 percent of water line. A completion date is scheduled for April 2016. Design for the 2015 Community Development Block Grant for sewer system improvements are complete and under review by ECD. The High Service Pump Replacement project, awarded to BAM 2, is complete with the exception of warranty paperwork. An Evaluation of the Wastewater Treatment Plant is underway. Design of several improvements at the Miller Avenue Wastewater Treatment Plant is approximately 50 percent complete. Design is complete for the OK Road and Coffey McGee Road Water Line Extensions and Plans were submitted to TDEC. Design work on the Cornersville WWTP Sludge Holding Tank is complete with a bid date of 2 PM, February 18. Plans and specifications for the State Route 50/431 Utility Relocation have been submitted to TDOT. Design of methanol and coagulant feed and storage facilities to enhance nutrient removal are underway. A report for inclusion in a 2016 CDBG Sewer Rehab project was submitted. Design for the Snell Branch SPS Renovation is in the preliminary stages. A WWTP Nutrient Optimization Plan was submitted to TDEC, late summer 2015, which resulted in a revised NPDES Permit. Further monitoring will be performed to confirm optimized plant operation. J&M Grading Division, LLC was the low bidder for the TDOT SR 52 Utility Relocation project. A pre-construction meeting is pending. Design is complete for approximately 3,500 L.F. of sanitary sewer line replacement in the Madison Square area and has been submitted to Owner for submission to KYDOW. Water Quality Modeling work is underway to determine the impacts of a reconfigured effluent discharge concept. The intensive field sampling is complete and calibrated model preparation is underway. A Beneficial Reuse of Special Waste Permit Application was submit- ted to KDOW on behalf of the Owner. Ohio County was recently awarded a grant, from the Abandoned Mine Land Program, to implement water system improvements in the Baizetown Road area. Construction on Cook Street Sewer Basin Storage Facilities is near- ing completion with the contractor programming the pump station. Tank is ready for use and a pump test has been conducted. Johnson Controls Pumping Station and Sludge Pump Replacement was awarded to Richland, LLC in the amount of $233,000. A pre-construction meeting was held February 5. A report for a 2016 CDBG Raw Water Intake Improvements project has been submitted to SCTDD. Phase I of the TDOT State Route 128 road widening is under construction. This project includes relocation of water, sewer, and natural gas utilities. Barsto is the contractor and the scheduled completion date is April 2016. An engineering report was prepared and submitted to the Owner related to pressure zone management and proposed system improvements. A Community Development Block Grant was awarded for water system improvements in the amount of $400,440. Plans and specifications are complete and under review by ECD. Portland Utilities Construction received the contract for approximately 2,000 L.F. of sanitary sewer line rehabilitation in the amount of $337,932. A pre-construction meeting was conducted February 8. Design is complete and plans and specifications are being reviewed by ECD for the renovation of the 2.16 MGD SBR Wastewater Treatment Plant, which recently received a Community Development Block Grant in the amount of $525,000. An Environmental Review is being conducted by the Project Administrator. Local Limits, adopted by the Owner, have been submitted to the State. Plans and Specifications are complete for the Main Street Gravity Sewer Replacement Project and a bid opening is scheduled for March 10, 2016. Evaluation on the Capacity Assessment Plan and Environmental Review for both Collection System and WWTP continues. Flow meters have been installed and a meeting with the Owner was held recently to discuss WWTP options. Trenton was also awarded a 2015 Community Development Block Grant that will include improvements to the Wastewater Treatment Plant. Utility line relocation plans for the I-69, Phase II & III as well as State Route 5 have been completed and are awaiting TDOT’s letting. Design work to replace an 8-inch waterline on Martin Luther King Drive is complete. NPDES Permit has been completed. Re-submitted Local Limits after TDEC reviewed and commented for final approval.